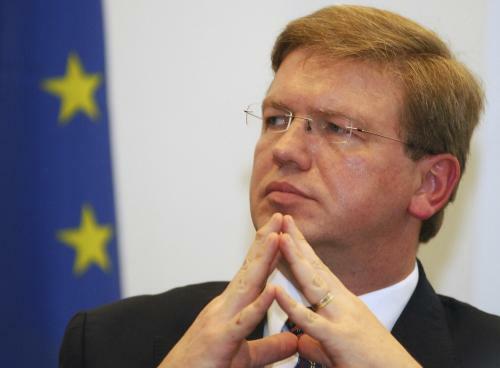 BRUSSELS, Belgium -- EU Commissioner for Enlargement and European Neighborhood Policy Stefan Fule has stated that association is a common goal of Ukraine and the EU, and the rejection of this process would "betray the people and principles of the Eastern Partnership." Fule said this at a press conference in Brussels on Tuesday while summing up the results of a meeting of the EU-Ukraine Cooperation Council. The Association Agreement will bring benefits to both Ukraine and the EU, while Ukraine's territorial integrity will be respected, the EU commissioner said. "There's no plan B. We believe that the rejection of the association process would be a betrayal of the people and the principles of the eastern Partnership. But this does not mean that we will compromise on the issues of democratic values, human rights, fundamental freedoms and the supremacy of law, which are a part of this agreement. Ukraine's commitment to European integration will be assessed on the base of its commitment to reform," he said. The EU commissioner once again expressed hope that Ukraine will find a solution to the problems of politically motivated persecutions and selective justice. While speaking about reforms, Fule noted the constitutional reform in Ukraine and said that the president of Ukraine set up a constitutional assembly. He added that this process should be supported comprehensively and transparently. "We have positive signals that Ukraine is ready to resume a serious discussion on the modernization of the gas transit system, which could open the way for receiving assistance from the EU and international financial organizations," he said. Fule outlined a number of other issues that should be tackled by the sides. In particular, he said that Kiev and Brussels decided to start an informal dialogue on the business climate. "This was a serious and sometimes difficult discussion. The measures we are expecting to be taken by Ukraine are absolutely clear, and political association and economic integration are our common goal," he said.